Cast of Sons of Anarchy. Charcoal Drawing of the cast of Sons of Anarchy , 17x24 in. on Canson Bristol Paper finished on 3/28/12. HD Wallpaper and background images in the Sons of Anarchy club tagged: sons of anarchy cast members charcoal jax clay gemma tara. 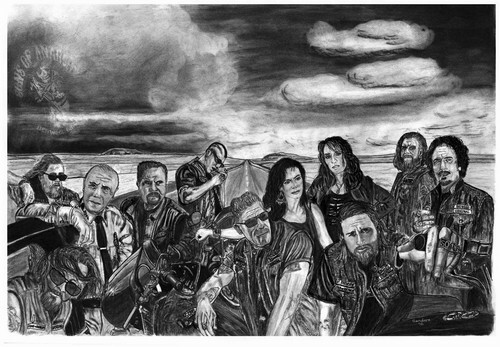 This Sons of Anarchy fan art might contain zeichen, plakat, text, tafel, schilder, and poster.